Hiving bees is a lot harder than it looks on youtube. I watched this video of the beemaster hiving bees, which he does quickly, easily, and thoroughly. I also read a couple of beekeeping books cover to cover, and various online instructions from bee package companies on hiving. I felt fairly prepared. I really should have gotten my beekeeper friend, Laurie, to come help out. 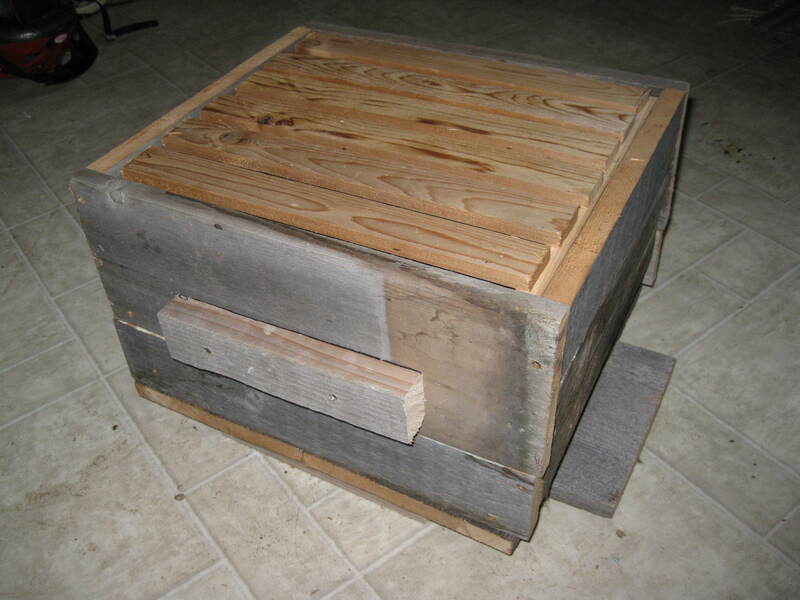 But first…I was finishing my two starter Warre hive boxes to accept my two packages right up to the last minute last Saturday, but I did finish. I realized as I finished them that the design I was following found at this website didn’t have bee space between the top bars and the screen/cloth laid on top. I don’t know if this is because the screen/quilt is supposed to give some, so that bees can crawl around, or if they aren’t supposed to crawl around above the bars, or if there is a mistake (I perused Warre’s original “Beekeeping for All” and didn’t find a beespace there either) or if I misread things, or what. I worried that I was going to crush bees. Especially because, not having completed the quilt or roof, I was planning to just lay 2″ foam insulation board over the top of the hive for now(on top of screen – why screen still? I don’t know). 4 lbs of Carniolan bees, a queen, and a can of sugar water. So I picked up my bees. It was just a hair over 40F and overcast out. I made a quick trip for the store, feeling for the poor bees in their packages in the back of the pickup, but needing to buy some human food and some sugar to make a spray for the bees. When I got home I took the boxes and bases I had made out to the back shed. The south wall of the shed is really just a cedar fence, so I cut off the bottom of the fence boards, set up concrete blocks a few feet apart against the fence, and set my bottom boards and boxes on on the blocks with the hive entrances facing the gaps in the fence. I placed the top bars in place to space them and then took out the middle 2 or 3, leaving them and the top screens (squares of window screen material) handy. Then I went in and mixed up a 1:1 solution of sugar water and put it in a clean spray bottle. I brought the first package out to the shed, sprayed the bees down, probably a bit excessively (they can drown), and went to hive them. Looks like you have 6 really wide top bars. Did you get some of those giant bees I been hearing about? The ones that like to build comb in every direction. Please post a picture of all the comb they built on the queen cage after you get back in two weeks…and let us know if she made it. Long story short, and I will post a longer update, but I killed my bees 😦 so no photos of comb. I think they froze to death, they built zero comb. In my haste, I think I left an air gap on one side between the hive box and the box I put on top with their sugar water cans inside as a quick feeding strategy (I will explain this more later). In my defense, I was very rushed with last minute work travel (both before and after the bees arrived). 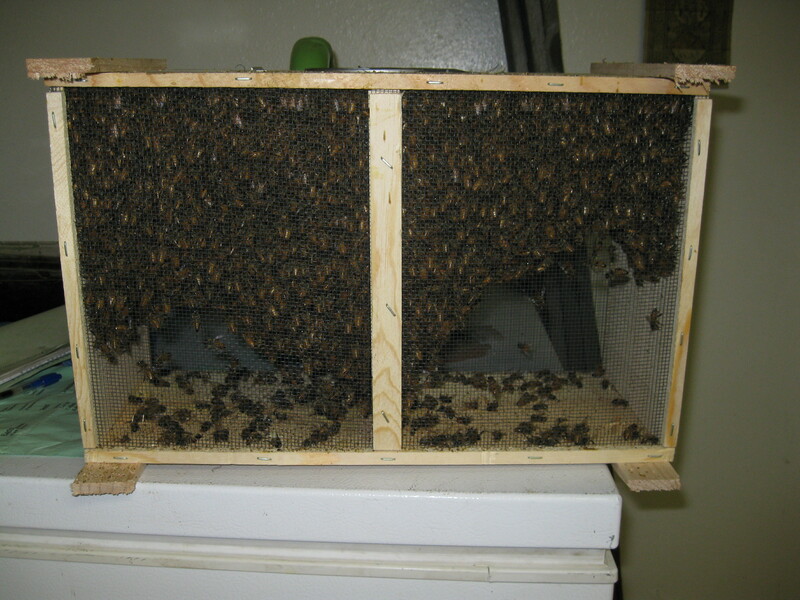 I feel very bad for the girls, but am also quite confident I will do better next year – have learned a lot (and be able to hunt some thinner lathe down so I don’t have to have the wacky thick mega-bee sized top bars that, yes, probably would have resulted in some very interesting comb formation, extra headaches, and inefficient use of space, but wouldn’t have killed the bees as my other last minute fixes did). Oh, and the queens lived long enough to make it out of their cages, scant solace that it. Oh Dear, I read part 2 first. You should have kept them in 60F house or garage for 4-5 days first, and sprayed them with sugarwater. Then hive them on a nice day. Then release the queen a couple days later. Oh, I should have called you but we were on vacation! Your YouTube was proabably not Alaska-ready…. I am sorry to hear of your misfortune. When keeping bees, we really need to be prepared and well learned on all aspects. I hope you make time and better preparation for next year. Good luck to you.